NEW YORK—As 2013 wraps up, so closes another year in which Governor Andrew Cuomo keeps the moratorium on high-volume hydraulic fracturing, also known as fracking, in New York State. The moratorium has been in place since 2008 and will continue until science has its say, according to the governor. Following intense public outcry over the controversial method of removing natural gas from shale rock, in September of 2012 Cuomo tapped State Health Commissioner Dr. Nirav Shah to review the public health aspects of the revised rules issued by the State Department of Environmental Conservation. Shah has repeatedly said the review would be coming “within a few weeks.” It is now over a year later and no review has been issued. The moratorium will continue without Shah’s blessing. During a question and answer session following the final cabinet meeting of the year reporters quizzed both Cuomo and Shah about when the highly anticipated health review would be complete. Shah cited two new studies, one from Texas and another from Wyoming, saying he would need to review the new data before making a decision. Cuomo the editorial board of the Syracuse Media Group in May that he expected a decision on fracking before the 2014 elections. 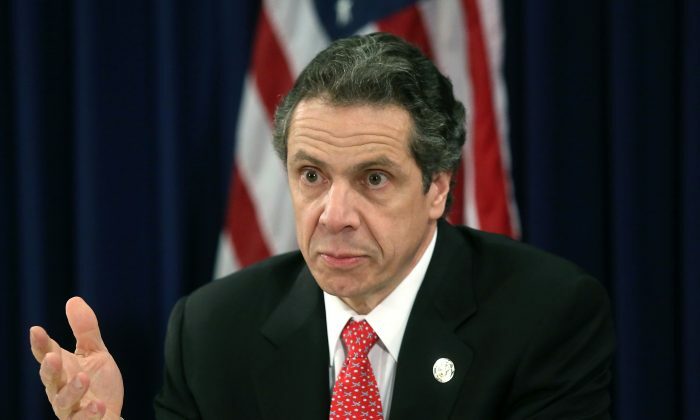 At the cabinet meeting on Monday, Cuomo was unclear if the 2014 deadline would be met. The issue of fracking is a political hot potato, one the governor managed to not get caught holding during his entire three years in office. During his time of indecision, the opposition to fracking has grown. Anti-fracking protesters continue following Gov. Cuomo around the state, including most recently at his birthday bash with Billy Joel earlier this month. According to a Nov. 26 Marist Poll, 47 percent of those polled oppose fracking in New York State with 37 percent in support, and 16 percent unsure. With the election year upcoming Cuomo runs the risk of alienating equal portions of the electorate no matter what decision he makes. Continuing to hold the decision while Dr. Shah reviews a never-ending stream of scientific reports provides political cover for Cuomo, but the move is starting to backfire. The oil and gas industry, who once viewed New York’s surplus of natural gas underneath the Marcellus Shale as a boon, has growing tired of waiting for the governor to make his move. In September Chesapeake Energy, one of the first oil and gas companies to invest heavily in New York, dropped their lawsuit and released 13,000 acres of land, according to Reuters.Epoch Times reached out to confirm the report, however a Chesapeake spokesmen declined comment. The Oklahoma-based company purchased the land at dirt cheap prices, before land-owners wised up to what their property was actually worth. The Independent Oil and Gas Association of New York (IOGA) has seen a dip in their membership as companies pull out of New York and head to nearby states who have regulated the practice like Pennsylvania, West Virginia, and Ohio. There is pressure from all sides on the issue of fracking, and at least for the time being, Cuomo has passed that pressure to Dr. Shah. But one thing is for certain: Cuomo is taking the decision seriously.